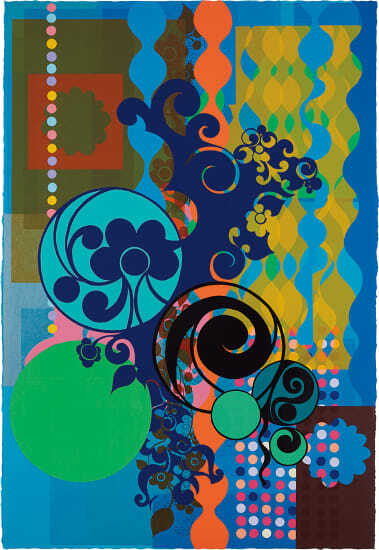 Beatriz Milhazes is best known for her vibrantly colored yet calculated compositions. The artist has cited Baroque architecture, lace work, Carnival decoration and the flora of the Jardim Botanico in Rio de Janiero chief among her inspirations. Milhazes' artistic practice is akin to monotype or collage in that the artist first paints motifs directly onto transparent plastic sheets and later applies them to the canvas, leaving the plastic to dry. The superimposed image allows for overlapping and layering, resulting in a textured canvas and a distorted central focal point. While seemingly chaotic, Milhazes' compositions are perfectly balanced due to the artist's technically sophisticated use of geometric forms and chromatic color palate. Screenprint and woodcut in colors, on heavy Hiromi handmade Kozo paper, the full sheet. Signed, titled, dated and numbered 17/30 in pencil on the reverse (there were also 5 artist's proofs), published by Durham Press, Durham, Pennsylvania (with thier inkstamp), framed.